First Thought when Finished: The end of Hunted was a little to abrupt and it felt like nothing really happened in the story. I still love the characters but this book in the series left me wanting. 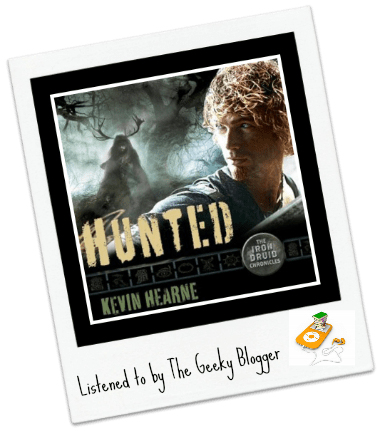 Story Thoughts: Let me start with this, even though I did not enjoy Hunted as much as the rest of the series there was still the Kevin Hearne writing that we all know and love. I can’t pinpoint exactly where the book and I didn’t connect. I wasn’t a fan of having things told from Granuaile’s POV but only because she didn’t sound like her old quippy self. I like her as a character but her POV parts just felt odd. I did like her in the story when it was from Atticus or Oberon though. Also, it felt like there was a lot of action but not a lot going on in Hunted. Yes, there were allies made and bad guys defeated (sort of) but it felt like one big peace treaty negotiation. Nothing wrong with that but Hunted felt more like filler (every series always has that one book that feels that way, this was this series book). Would I read it again? As part of a series reread absolutely. Do I think it would have worked better for me if I could read the next book? Probably. Character Thoughts: I love Kevin Hearne’s characters. They are the reason I love this series. Atticus, Oberon, and Granuaile are supported by some great characters from Mythology/Folklore/Kevin’s Imagination. There were a few sad moments in Hunted and now there are some characters that will no longer be with us. I will miss them but my favorites are still around. You can’t go wrong with The Iron Druid characters. They just rock! Luke Daniels is awesome! Seriously I could listen to him read the telephone book. However, he excels at Atticus and Oberon. He is the characters in the Iron Druid series. I couldn’t imagine anyone but him reading them. If you haven’t listened to Luke Daniels read/act/bring to life The Iron Druid Chronicles then you are missing out. I highly recommend him. Final Thoughts: Even though this wasn’t my favorite, Hunted still had its fun moments. Don’t miss out on the brilliance that is Oberon and Atticus. They do have their moments! You are spot on with your review. It was a good book, but not great and it did miss some things. Still, waiting impatiently for the next book. I am very very sad about the one who was killed in the beginning though, will miss that character very much. I’ve got this series on my library wishlist. It really is very good and lots of fun. One of my favorite UF series. Yeah, I liked this one but didn’t love it. Maybe that’s why I haven’t reviewed it yet. Gran wasn’t herself and I didn’t like her POV (which was surprising, since I do love the character). Gran wasn’t herself and it made me a little sad. I love her character on a whole and hoping that next book either a)he nixes her POV or b) he makes her quippy again.